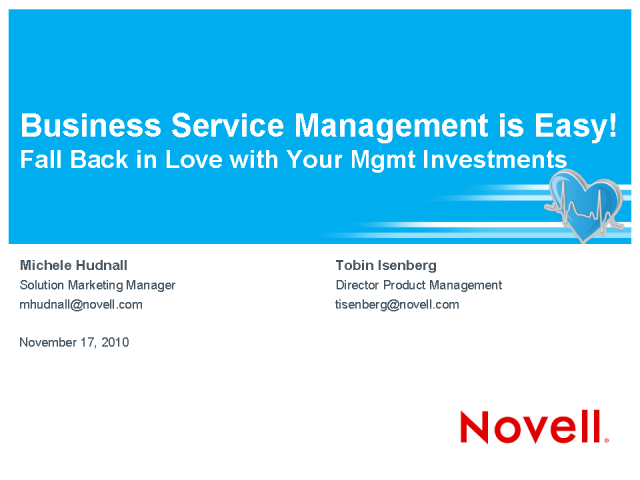 BSM Is Easy: Fall Back in Love with Your Management Investments! A single service-impacting event costs organizations 1-2 percent of revenue. IT resources cost organizations 1-2 percent of revenue merely "Keeping the Lights On" - reacting and maintaining. It is easy to begin managing infrastructure as services gaining control over the chaos and aligning to business priorities. •What Do I Need and What Could it Look Like? Join industry veterans, Michele Hudnall, Solution Marketing Manager BSM and Tobin Isenberg, Director of Product Management; each with 25+ years of industry expertise and experience in this live interactive webcast. Title: BSM Is Easy: Fall Back in Love with Your Management Investments!